Speaking of classic manga adaptations, AnimeNewsNetwork has announced that the 1982 animated film The Last Unicorn is getting a theatrical re-release in 2012 and 2013, and author Peter S. Beagle is planning to attend every event honoring the film based on his 1968 fantasy novel. 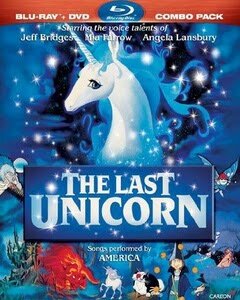 Wow, The Last Unicorn must be a bigger money-maker than I realized. If your local indie movie theater could use a piece of 80s-nostalgia pie, you might want to suggest they book this movie (and Mr. Beagle's presence) early.